ANNAPOLIS, MD – Governor Larry Hogan on Tuesday announced the start of a study that will identify the location and explore potential funding options for a new Chesapeake Bay crossing. The $5 million “Tier 1 National Environmental Policy Act (NEPA)” Study, which was voted on and approved by the Maryland Transportation Authority (MDTA) Board last week, will begin this fall and take up to 48 months to complete. Following today’s announcement held overlooking the Bay Bridge, Governor Hogan also unveiled a new Maryland license plate design. The MDTA – the agency that finances, owns, operates, and maintains the state’s eight toll facilities – will conduct the study, and more information will be available on mdta.maryland.gov as the Tier 1 NEPA study progresses. Extensive public and community outreach efforts will include focus groups, listening tours, public workshops, a project website, newsletters, and fact sheets. Following the announcement, Governor Hogan unveiled Maryland’s new license plate design, which will feature the Maryland flag front and center. The Maryland Department of Transportation’s Motor Vehicle Administration (MVA) will start issuing the new plate on Monday, September 26 for all passenger cars, SUVs, trucks, motorcycles, and multipurpose vehicles. 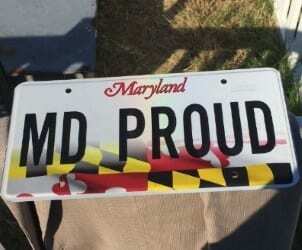 To order the new Maryland Proud plate after September 26, visit the MVA website at mva.maryland.gov and click Online Services.